Do you want to get paid as a social media influencer? Do you want people to come to you for social media advice? Are you trying to become a social media influencer? Publishing on social media is a great way to share expert knowledge and develop your influencer status. In this article, I’ll share nine tips that can help you become a social media influencer. Discover nine tips for becoming a social media influencer. To become an influencer, master a specific topic within your niche. If you cast your net too wide, it will be difficult to gain the level of knowledge necessary to be considered an expert. Either focus on one social media industry such as social media marketing or public relations, or on a single platform like Facebook, Twitter, LinkedIn, Pinterest or Instagram. 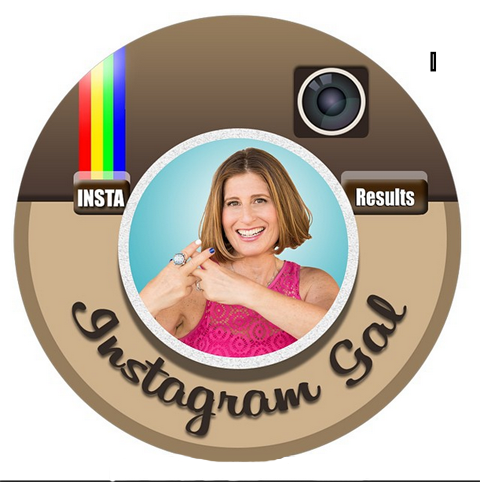 For example, Sue B. Zimmerman (also known as #Instagal) found success in the social media space by focusing on Instagram. She is now the go-to person for those looking for advice on Instagram for business. Master one topic to become a true expert. Start small and learn as much as you can about your desired niche through research and experimentation. That way, you’ll be able to discover the ins and outs of your specialty and form your own ideas, as opposed to simply restating others’ opinions. This is a very important step on your way to influencer status. Social media is unique because it is in constant flux. Stay on top of the latest platform updates, such as algorithm changes, new analytics and added features, as they can drastically change a social channel and the way it’s navigated. Whether you want to be viewed as the authority on a social channel or a broader industry, read platform blogs regularly: Facebook, Twitter, LinkedIn, Pinterest and Instagram. There’s no better way to keep tabs on any social media channel. In addition to platform blogs, read other information outlets to gain valuable insights into your niche. Study news, expert opinions and case studies that are published or shared by people you trust. By using a tool like Feedly to subscribe to a variety of relevant industry blogs, you will benefit from different viewpoints and helpful advice. Reading press releases, news alerts, and relevant posts is key to staying informed. When you know what’s happening, you can keep your followers in the know. Since it is impossible to keep track of all of the information from platform blogs and your favorite outlets, invest time into creating alerts directly related to your focus. 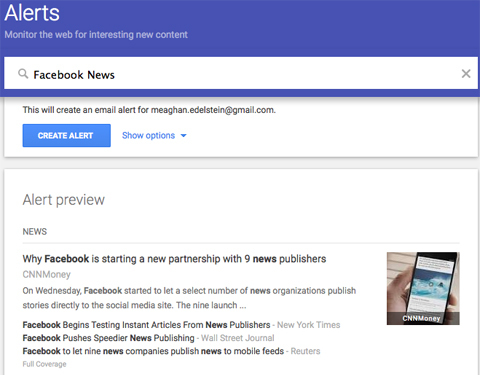 Two free tools that make it easy to stay on top of relevant news are Google Alerts and Social Mention. Set up alerts to stay on top of the latest news and updates in your niche. If you hope to be viewed as an influencer, you’ll need to demonstrate that you’re always aware of the latest news. Better yet, know what changes are coming even before they’ve been implemented and clue your readers in. If you haven’t already done so, create a blog on a publishing platform such as WordPress. Then write blog posts and publish consistently. You should shoot to publish at least two to three times each week. To stay on track, create an editorial calendar and stick to it. In addition to your own content, partner with other influencers. Interview them, invite them to contribute to your blog or run a promotion together that gets shared on everyone’s sites. In addition to your own blog, create long-form posts on LinkedIn’s publishing platform. Cut and paste your previously published blog posts and add a headline, image, and keywords. Remember, people generally assume LinkedIn posts are only from the most influential thought leaders. Now, when people in your network and beyond see your articles on LinkedIn, it is likely they will view you as an authority too. 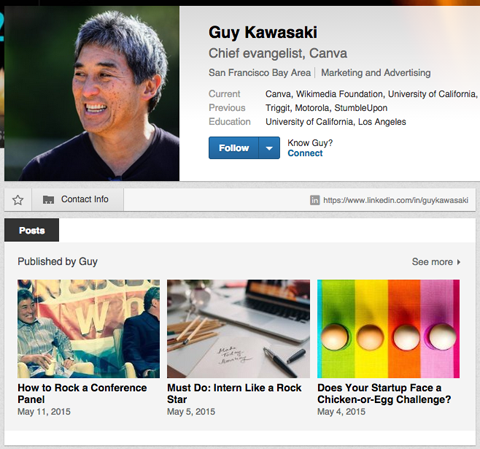 Share your knowledge and get noticed by publishing on LinkedIn. Through its publishing platform, LinkedIn has created a prime opportunity for influencers to get noticed. Once you’ve determined your focus and have implemented a system for keeping on top of the latest news and information within your niche, start sharing high-value influencer content with your audience via social media. If you’re a platform-specific influencer, use that as your primary social network. Utilize the others as well to get even more visibility. To be considered an influencer, people need to see you as a resource. Consider your audience and share content that they’ll find useful. Post original articles, plus posts from other trusted sources. Keep your content organized for easy access so if someone asks a question, you can quickly grab content that provides an answer. One of the quickest ways to gain influencer status is to contribute your unique content to other blogs and publications. 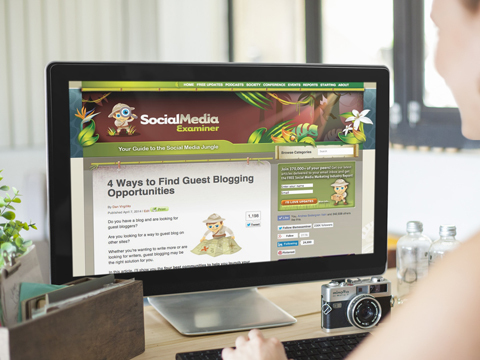 Guest posting increases your visibility, bolsters your credibility and increases traffic to your own blog. Writing for influential sites raises your influencer status. Image: Placeit. 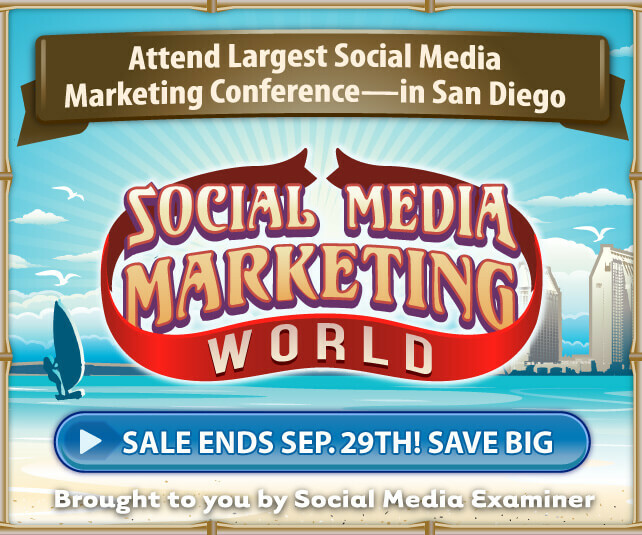 Seek out the most appropriate social media websites and blogs, research submission guidelines and reach out. After your content is published, let people in your network know. Tweet a link, share it on Facebook, tell your other online communities and add it to your LinkedIn profile publications. Also, keep an eye on your article’s comments, so you can respond to any questions or remarks (both positive and negative). To be an influencer, you need to be seen. Social media influencers regularly take part in relevant conversations across a variety of networks. Attend and participate in Twitter chats and webinars (and host Twitter chats too), answer questions on Quoraand share ideas in LinkedIn groups. Also, engage regularly across platforms. Don’t just tweet, post, comment, like and share. Add your comments and opinions. Sharing your knowledge is how you’ll truly stand out as an influencer. If your goal is to be an expert in the digital space and become known as an influencer, there are plenty of things you can do to raise your profile. 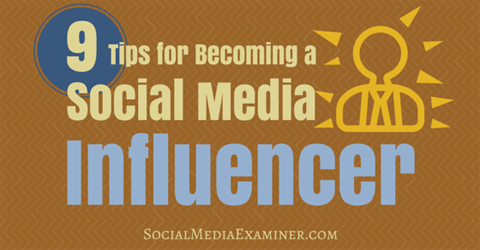 Develop your expertise and use social media to raise yourself to influencer status. Don’t hesitate to contact us if you want to become a social media influencer, our Social media influencer training program help you build your influencer status from scratch at the end of which our agents will be happy to propose your services to companies.